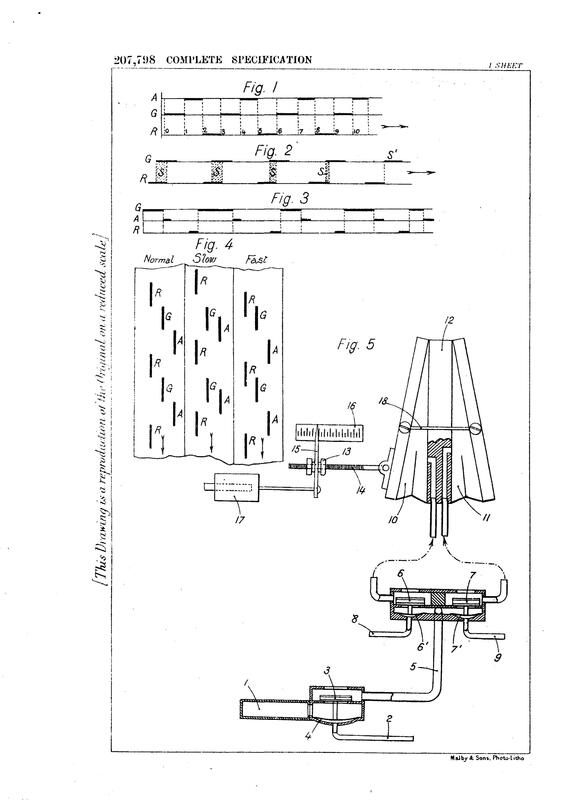 This is a reproduction of Page 6 for British Patent #207,798, featuring 5 drawings of the Pleyel application, granted in 1924, for synchronizing extra Player-Pianos, phonographs and/or motion picture projectors. The "G" perforation on the Master Roll meant "govern" or "recalibrate". When the extra Pianolas - or other mechanisms - are in synchronization, the "G" perforation does not overlap the "A" (accelerate) or the "R" (ritard) holes. They operate in sequence: "R" "G" "A", "R" "G" "A", etc. when everything is running together. Should the "A" or "R" perforation overlap the "G" hole, then the system operates the 'tracker pneumatic' feature (similar to those in Pianola spoolbox designs) and proceeds to move the Tempo Lever to a faster or slower position, achieving the sequential "R" "G" "A" cycle once more. To claim that this device didn't work - as is being done in this era of muddy-sounding MIDI player instruments sloshing through "Ballet Mécanique" - simply isn't true. The principle worked for various American companies, usually engaged in synchronizing phonograph records [Autopiano of Kohler & Campbell as well as American Welte-Mignon] ... or for changing the tempo settings on music rolls, as with Melville Clark, Welte-Mignon and The Aeolian Company. The 2 latter companies employed applications of these principles for tempo control, which were applied to both player pipe organs as well as electric 'reproducing' pianos. We recommend that you print the descriptive pages for this unusual patent. Then, you can you read the admittedly cluttered text which 'explains' how the Pleyel Piano Co. intended to synchronize 2 or 3 player instruments.